What’s an island holiday without a sea view? Every Superior Room in one of our Praslin hotel’s beach bungalows has a veranda and double sliding glass door behind classically colonial inspired wooden shutters. So, you can let the outside in or enjoy deep sleep and privacy. 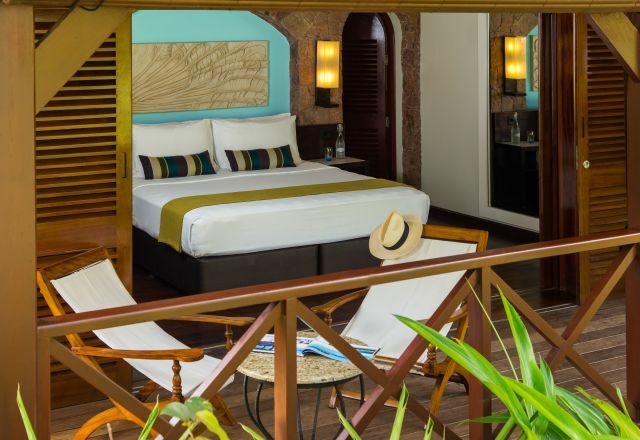 Each room is designed with unmistakable Seychellois charm and traveller conveniences. King size beds in rooms with double ceiling fans and air-con to complement the local design that makes the most of natural ventilation. Wooden floors, wrought iron details, porcelain cool ceramic tiles and exposed granite walls along with home-comforts like a flat-screen TV and unlimited WiFi. Whether you choose to connect or stay island-elusive the choice is yours. Bathrooms feature a large glass walk-in-shower as well as a toilet and bidet for guest comfort. Yi*King amenities are all-natural spa products celebrating bountiful Seychelles nature. Complimentary glass bottled water is filtered on-site as part of our eco-conscious initiatives. A walk-in dressing room features wardrobe space for making yourself at home on the island as well as a mini fridge and electronic safe. Take it all in, from the tropical flowers in our gardens, to the bright green geckos, from the softest sand to the blues and greens as the sea meets the sky from your private veranda. From morning to night, time is well spent balcony lazing. Paradise Sun Praslin hotel has 14 double-story and 7 single-story French-Creole bungalows with either two or four bedrooms. All are below palm tree height and no more than 70 metres from the beach. Paradise Sun is as family friendly as it is perfect for couple-romance. For group travel or bigger families, a number of balconies feature interleading doors to combine the whole top floor of our beach bungalows. Accommodation at Paradise Sun on Praslin island includes a choice of 70 spacious Superior Rooms.